These elegant 14K white gold earrings feature diamond shaped figures set with a single square cut sapphire and round cut diamonds. 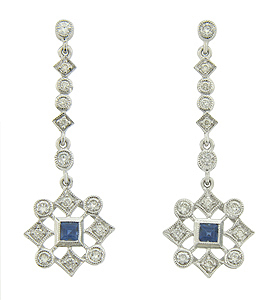 The floral figure dangles from a string of round and diamond set figures. Set on posts the earrings measure 1 1/4" in length, 7/16" wide.